Just when Boysie Oakes thinks he is out of the liquidating business, he finds himself on the sunny shores of Lake Maggiore. His task? To make sure that a Member of Parliament breathes his last breath. But a straightforward mission start to go awry when his mark turns up dead without Boysie lifting a finger. It is only when he is introduced to a sadistic finishing school, run by the mysterious and dangerous Doctor Klara Thirel, that the mystery starts to unravel. Surrounded by troubled girls galore, including a certain Petronella Witching, Boysie is pulled into the biggest espionage foul-up of the century. With the help of Petronella, as well as a handful of self-important, and at times incompetent secret agents, Boysie dives into the mysteries behind the dead Member of Parliament, the sexually charged finishing school, and – most of all – who and what is behind the top-secret Amber Nine. 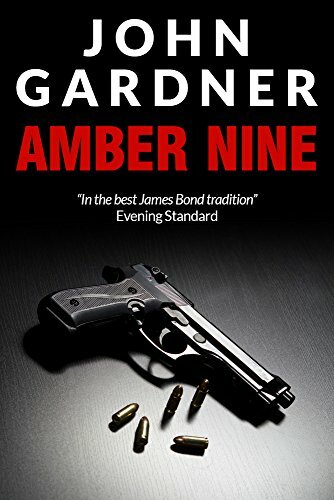 ‘Amber Nine’ is the third in the series of highly acclaimed comic novels featuring the cowardly secret agent, Boysie Oakes. It is perfect for fans of classic British spy fiction, including Ian Fleming, Len Deighton, and Desmond Bagley. Before coming an author of fiction in the early 1960’s John Gardner was variously a stage magician, a Royal Marine officer and a journalist. In all Gardner has fifty-four novels to his credit, including Maestro, which was the New York Times book of the year. He was also invited by Ian Fleming’s literary copyright holders to write a series of continuation James Bond novels, which proved to be so successful that instead of the contracted three books he went on to publish some fourteen titles, including Licence Renewed and Icebreaker. Having lived in the Republic of Ireland, the United States and the UK, John Gardner sadly died in August of 2007 having just completed his third novel in the Moriarty trilogy, Conan Doyle’s eponymous villain of the Sherlock Holmes series.